Above is a wide sweep, the frequency we want to focus on is around 13MHz. 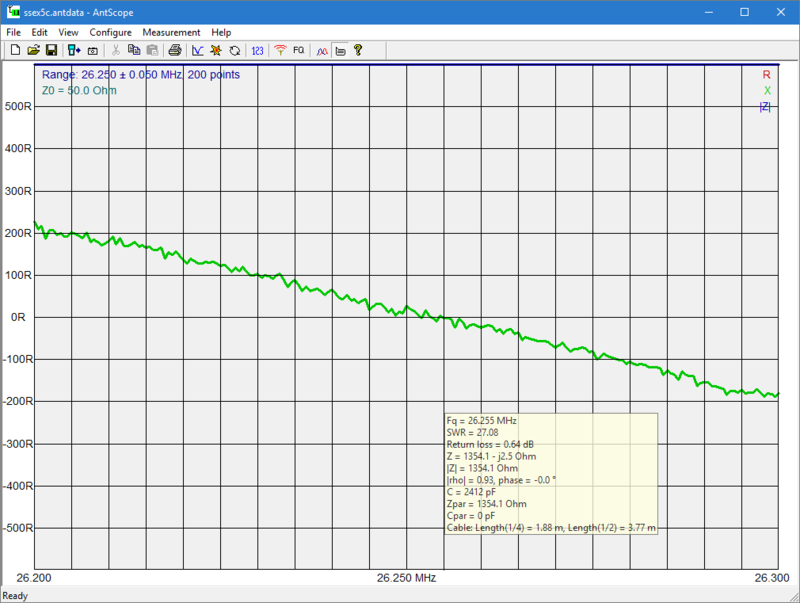 Above is a scan expanded around 13MHz. Rin is 1.4Ω. Consulting a good line loss calculator, we should have expected around 0.057dB/m, so the cable is bad and/or the measurement is bad. VNAs and analysers (which are often one port VNAs) are not very good at measuring very low or very high impedances due to several aspects of their operation and implementation. 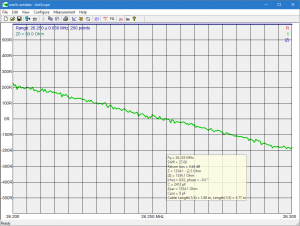 I have made this measurement with a Rigexpert AA-600 using its built in termination, and it is not good enough to measure tenths of an ohm accurately. This analyser is capable of SOL calibration and with that it would give better results, but I want to show what happens for most analysers that are in common use. Indeed, this analyser is way better than low end analysers that use 8bit ADC… so your results might be poorer than I obtained. The better formula I have proposed can also use Rin of high impedance line section where X passes through zero (the simple formula cannot). Above is a plot of Z at the next point where X passes through zero, it is a high Z measurement. 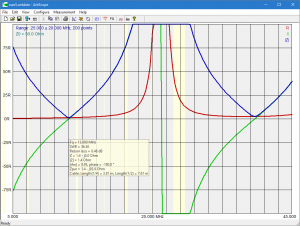 Although the curves are out of range of the available scales, the cursor hint box shows Rin=1354Ω. 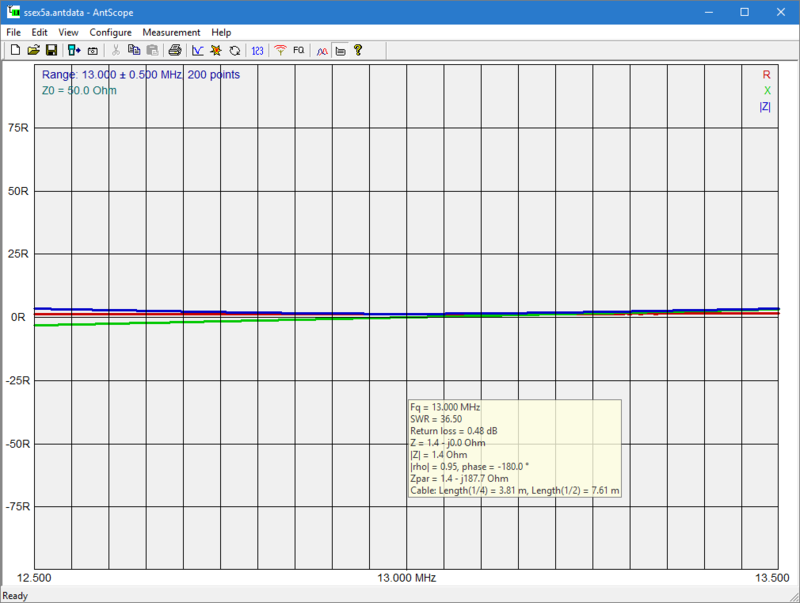 Consulting a good line loss calculator, we should have expected around 0.161dB/m, so the cable measurement and cable appear good. This high impedance measurement will fail with most low end analysers, and again, any analyser SOL calibrated should deliver better results. 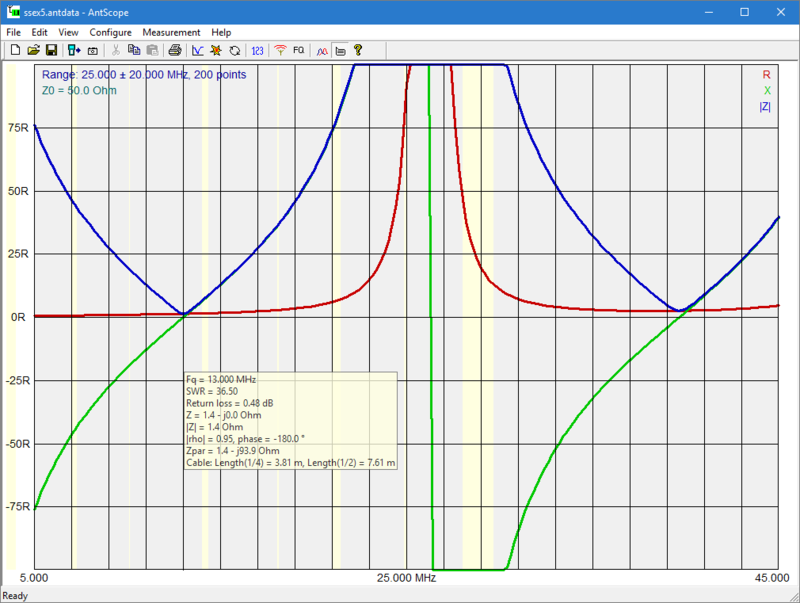 See the online calculator at Calculate transmission line Matched Line Loss from Rin of o/c or s/c resonant section. Despite some authors advising that the high Z measurement fails and the low Z measurement suits most analysers, the experience here with a good mid range analyser is the opposite. 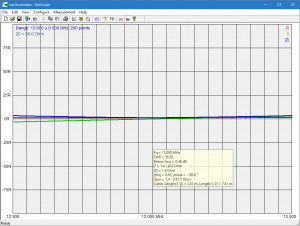 I would argue that both measurements take these instruments to the limit of their measurement range, and neither is well suited to low end VNAs and analysers. Clearly longer / lossier line sections will be less challenging than the quite short line section in our jig. If you must use this method use the second formula, and use SOL calibration of your analyser if possible. Better still, use a method and instrument that together suit the application.